I hope your week’s going better than mine. I’m not trying to be a downer, but a series of unfortunate events beginning yesterday afternoon when I left work, really threw a wrench into my mood. And I don’t know about you, but when I’m having a tough day, I need a pick me up, usually in the form of chocolate or some other comfort food. 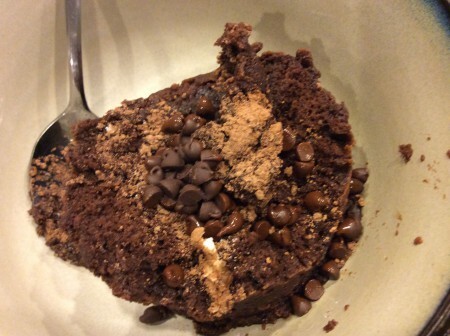 Lucky for me, the recipe below is chocolate cake that can be whipped up in under three minutes. How sweet is that? So what happened, you ask? Well, it started yesterday morning: when I got in the car to go the gym (I go everyday during the week at 5:30 before work, ungodly early, I know, but if I don’t do it then, I’ll lose my motivation by the end of the day). My car turned on, but the engine sounded a little strange. No big deal. However, when I got in the car to leave the office after work, it wouldn’t turn on. Nada when I turned the key. Major bummer. A friend of mine jumped my car (thank you, Sean, for making me put jumper cables in the car), and I limped home. When Sean arrived, he removed my dead battery, drove me to the local car store, I exchanged the battery for a new one, we went home and he installed it. My mechanical knight in shining armor. Trial #1: overcome. Unfortunately all the running around after work, meant we had to miss a special event we were supposed to attend that evening. When 7 PM, the start time, rolled around, we had no chance to make it. Super bummer, especially since it involved cake. Trial #2: fail. And to top it all off, I was experimenting in the kitchen with cauliflower, and learned the hard way that a blender will not substitute well for a food processor when trying to make cauliflower resemble mashed potatoes. Trial #3: major fail. On the whole, it was not the most successful evening I’ve ever had. And by the end, when I threw in the towel, I was not in the best mood. Frustration, end-of-my-rope, call it what you want, I needed a pick me up. I needed chocolate. I needed it now. Thus, my chocolate coffee cake mug came together and put a nice salve on the wounds inflicted by the day. It was so good, my friends. The perfect end to a not so perfect day, ready in less than 5 minutes. In a 12 oz. (or larger) coffee mug, combine the flour, sugar, cocoa and coffee. Add the egg, vegetable oil and milk and stir well. Next, add the vanilla extract and chocolate chips and whisk until any lumps are gone. Place mug in the microwave and cook on high for 2-1/4 to 2-1/2 minutes, depending on how well done you like your cake. Transfer the mug’s contents into two bowls and top with more chocolate chips, ice cream and whipped cream if desired. Enjoy your super fast and easy dessert! Tell me this doesn’t look like it took longer than 2 minutes to make! 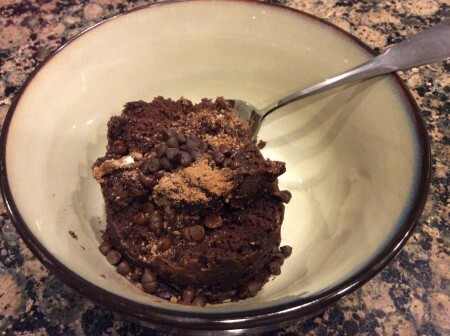 This entry was posted in Desserts, Recipes and tagged Cake, Cake Mug, Chocolate, Chocolate Cake, Chocolate Cake Mug, Chocolate Coffee Cake, Chocolate Coffee Cake Mug, Coffee, Dessert, Mug, Recipes on January 28, 2015 by Paige N..